It’s not really possible to miss it, that new shop gear is everywhere! There’s a big advertisement in the wow launcher and everyone is talking about it, on blogs, the internet, ingame and probably in real life too. I’m not sure how to feel about it since it might be a step towards adding more important and actually useful items to the game that can be only achieved by paying even more money, which isn’t exactly the direction I want this game to go for. But on the other hand, as long as they keep it this way and don’t advance any further it isn’t even too bad, especially since the new shop gear doesn’t look that great. On top of that it’s way too expensive – when I see someone ingame with it, I don’t think ‘hmm, that looks kinda cool’ I think ‘damn, someone paid 15 dollars for that weird hat?‘, which probably isn’t what they were aiming for with these. But for real, if they made actually good looking gear for 2 dollars a piece I would seriously consider buying it if I had some good money left for that month, but 15? For one hat? No way! 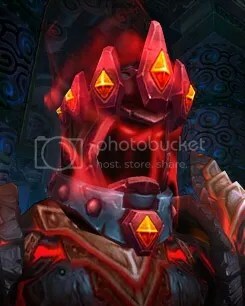 This headgear is the more unusual one than the other two I guess, there are horns in the game already, but for everyone who wants to look like a warlock or something without actually being one this seems to be the item of choice – except that it looks pretty weird. If I think about it objectively, they’re probably made to look like proper horns, big and intimidating like the ones Red in Hellboy has or basically like any other demon with big horns. 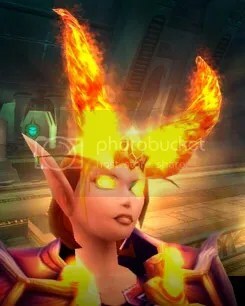 But all I see is a pair of huge and mutated flame druid eyebrows, it’s what my mind does with this one, so I can’t possibly take anyone who wears it seriously or even consider getting it myself, unless I want to look awkwardly hilarious. It has a nice dark red colour theme and I actually think there is normal gear in the game that it can be worn with eventually without looking completely out of place, and it’s cool without having as much of the forced badass touch the other two have. Though I do find it sad that the top part looks very similar to the Crown of Eternal Winter, doesn’t exactly look like there was put that much work into these items that would justify the high price they are sold for. The Hood would be an item I might consider buying at some point if it was actually a micro transaction price, but not with this halfassed try of opening up a big new source of income. So in the end it comes down to: nice try, Blizzard (or Activision? ), but not quite there yet. I’m pretty sure there will be a considerable amount of people who will buy these items and give them the money they want/need so badly, so as long as it keeps WoW running I don’t even mind so much. Those are nice additions for someone who wants to look different, and I always like the introduction of new item models. 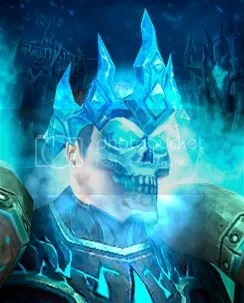 This entry was posted on Saturday, July 20th, 2013 at 20:08	and tagged with Blizzard Shop, Cosmetic Gear, Crown of Eternal Winter, Hood of Hungering Darkness, Jewel of the Firelord, world of warcraft, WoW and posted in Stuff, World of Warcraft. You can follow any responses to this entry through the RSS 2.0 feed. An impressive share! I’ve just forwarded this onto a co-worker who was doing a little homework on this. And he actually bought me dinner simply because I stumbled upon it for him… lol. So let me reword this…. Thank YOU for the meal!! But yeah, thanks for spending some time to talk about this matter here on your internet site.